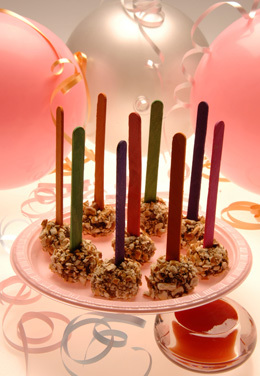 Instead of popsicles on a stick surprise your friends with snacks on a stick. Serve with raw vegetables for lunch and dip into your favorite sauce. Popsicle sticks can be purchased in dollar stores or craft stores. Preheat oven to 375ºF (190ºC). Place pretzels in the plastic bag, seal or tie with twist tie to. With a rolling pin or the bottom of a mug crush the pretzels to make coarse crumbs, pour into small bowl and set aside. Clean mushrooms with a damp paper towel or mushroom brush. On the cutting board with the sharp knife trim the bottom of stems; place mushroom pieces in a food processor and finely chop or finely chop the mushrooms with a sharp knife on the cutting board. In a medium bowl mix chicken, mushrooms, bread crumbs, onion flakes, soya sauce, garlic and gingerroot with a large spoon. Fill another bowl with water; dip your hands in the water. Then roll about a tablespoon of chicken mixture in your hands into a ball and place on a large plate. (The water prevents the mixture from sticking). Wash hands with warm soapy water and dry thoroughly. With cooking spray lightly coat baking sheet. Now roll each ball in the crushed pretzels to cover completely and place on baking sheet. Wash hands again. Press a wooden stick into each ball all the way to the bottom. Bake about 30 minutes. With oven mitts remove baking sheet from oven to cooling rack to check for doneness. With sharp knife cut one through the centre to see that no pink colour remains or insert an instant read thermometer and it should read 165º (75 ºC). If not return to oven for 2-3 minutes. Cool slightly before serving with sauces to dip into if desired. Tip: Replace bottled garlic with 1 clove garlic, minced and replace ground ginger with 2 tsp (10 mL) finely grated fresh gingerroot.